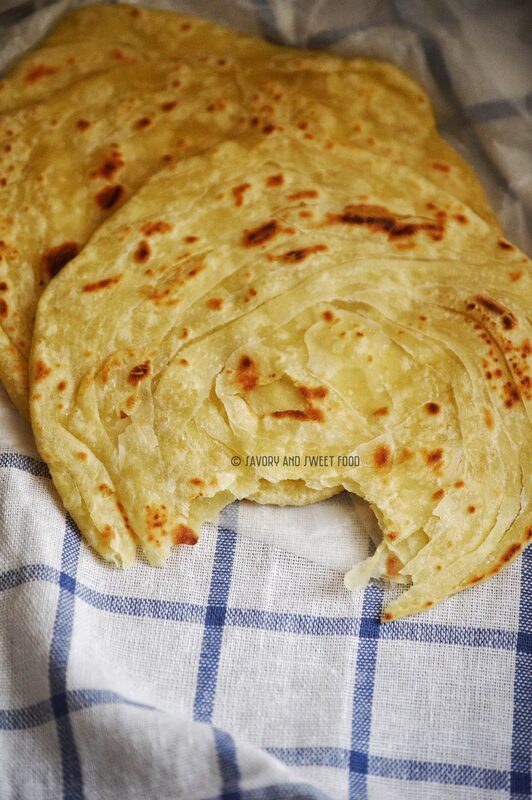 Malabar Porota, Parota or Barota is a layered flatbread made from all purpose four which required a lot of kneading in order to get a soft dough. This flat bread is flaky and fluffy, crisp, yet soft. This is a delicacy of the Malabar region of North Kerala. 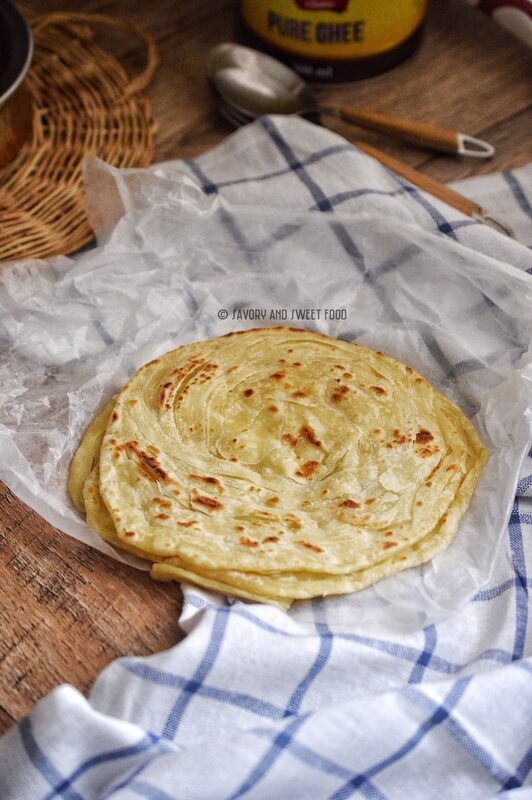 The famous Malabar Porota, even though we all know that this may not be the healthiest of dishes to have, the thought of gorging this flaky flatbread gives immense joy to us. Am I not right? Enjoying a nice plate of hot Porotas, guilt free, can be allowed once in a while…like maybe once a month. 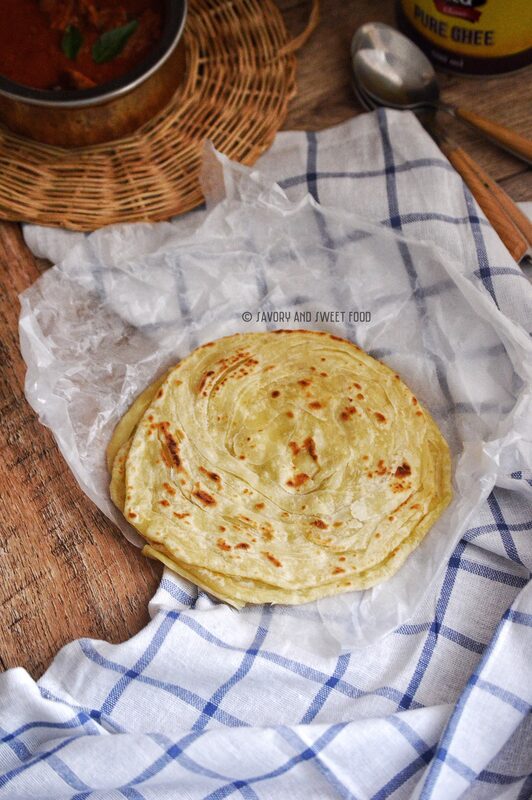 This porota is distinct from the north Indian Lachha Paratha but is a lot similar to its Malay counterpart, Roti Canai. 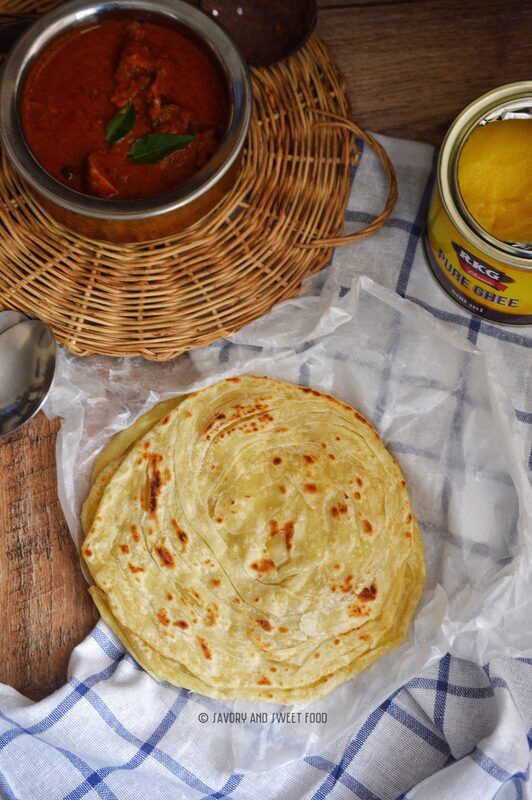 This bread pairs well with many different dishes, it traps the gravy well in between the layers especially thick chicken curry in coconut milk, Vegetable korma, Egg Roast etc. The prefect combination with porota is Kerala style Beef Fry, like the one in my previous post. Even though it takes out a little (actually a lot) of your time and energy to make this Porota from scratch at home, I can say that it will be worth all the effort. Instead of cutting the rolled dough into strips, you can make pleats out of it too. But I found cutting method better to get good layers. Always serve the porota immediately after cooking as it may turn a little hard after sometime. 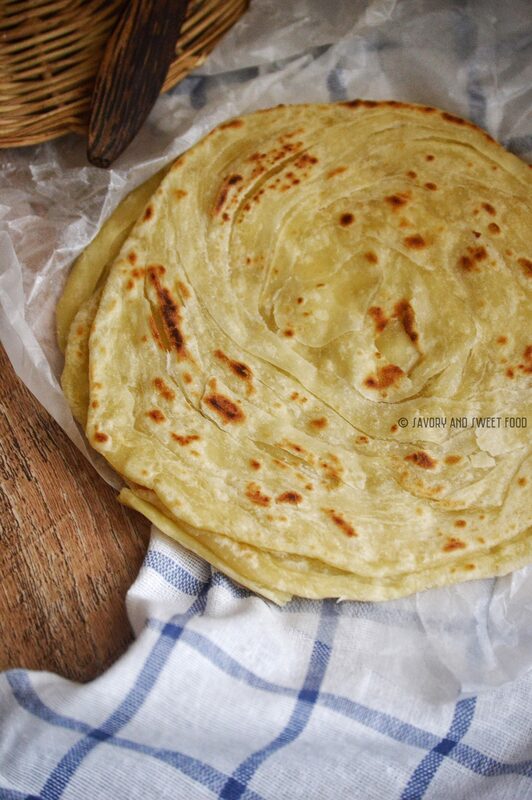 The more oil you use while rolling, the better layered porota you will get. You should knead the dough really well to get a soft porota. In a bowl, add all the dry ingredients and stir well. Make a well in the center and add the egg, water and milk. Stir with a wooden spoon till everything comes together. If you feel that the dough is sticky, add in few more tbsp of flour. Transfer the dough to the kitchen counter and knead well for 7-10 minutes till the you get a soft elastic, dough. (I transferred my dough to a stand mixer with a dough hook and let it run for 5-6 minutes). Grease the dough well with 2-3 tbsp oil and let it rest in a bowl, covered for 1-2 hours. Divide the dough into 5-6 balls. Cover and let it sir for 5 minutes. Oil your kitchen counter lavishly and start rolling the dough ball into extremely thin rounds. The thinner the dough, the better. Bring all the strips together and curl it into a round and tuck the end into the middle. Spread oil all over the dough. Let it sit for 1 hour, covered, preferably with a damp cloth. Heat a griddle on high heat and place the porota on the pan. Reduce heat to medium. Cook the porota on both sides applying ghee, until it turns golden brown. Make all the porotas the same way and stack them together. Beat or crush the porotas with both your hands till the layers separates.Serve immediately. Make all the porotss the same way and stack them together. Beat or crush the porotas with both your hands till the layers separates. The more oil you use while rolling, the better porota you will get. Yeeah true. I tried to veeshal too, but mine was tearing. this one is easier method and you’ll get the layers for sure too. Looks so flaky and nice clicks as always….